Well, I found them interesting. Largely because no one had ever told me them before. You probably know them already. Here goes. Loafers are for people who loaf. And you’ll never guess who people that loaf are. They’re Norwegian farmers off to see their cows. You see, the cattle loafing area is the place on a farm where the cows are taken to be milked. And Norwegian farmers used a certain, convenient slip-on shoe to get out to this loafing area. Hence it’s called a loafer. That Norwegian shoe must have been different to the slip-ons we see today. Only the very rich or eccentric would go out to milk his cows in his Gucci loafers with classic riding bit. Think of the mud. But the idea was there – the design built of necessity, a simple shoe that could be popped on for a brief job outside, and removed with ease when you returned to the house. Similar, in a way, to the reason so many more people wear loafers for flying these days. It’s much quicker to check you’re not a shoe bomber. This brings us on to my second exciting fact. The loafer is often referred to in the US as a Weejun because it sounds like the last two syllables of Norwegian. Perhaps you knew that already, but I didn’t. Imagine how satisfying the mental connection was. So instant; so obvious. It turns out that just two years after the Esquire story, in 1934, John R Bass, Maine shoemaker of repute, introduced a loafer with a bar bridge across it, and christened it the Weejun to sound like Norwegian. The bar bridge was supposedly shaped like Mr Bass’s wife’s lips. It was as if Mrs Alice Bass were kissing the feet of her husband as he left the house every day. Last but certainly not least, when the Bass Weejun became popular on US campuses in the 1950s it was occasionally used by students to carry a penny or a dime, in the event of an emergency phone call. Hence the penny loafer. Any or all of these facts may be erroneous, mythical or just plain made up (would the penny fall out if you ran anywhere?). But they are satisfying – a stylistic, philological and cultural history rolled into one. As mentioned in a previous debate on slip-on shoes (Reader’s question: The deck shoe) I prefer the more elegant, less chunky slip-on. This season, Paul Smith’s dark green or red “Marcello” loafers are worth a look. Let’s face it, you probably don’t have any red or green slip-ons already. You can follow the discussion on Interesting facts on loafers! by entering your email address in the box below. You will then receive an email every time a new comment is added. These will also contain a link to a page where you can stop the alerts, and remove all of your related data from the site. Interesting point…are you saying that loafers or weejuns are more American than British in their use? Could be…I mean, you bring up a great point. They’re lazy shoes. 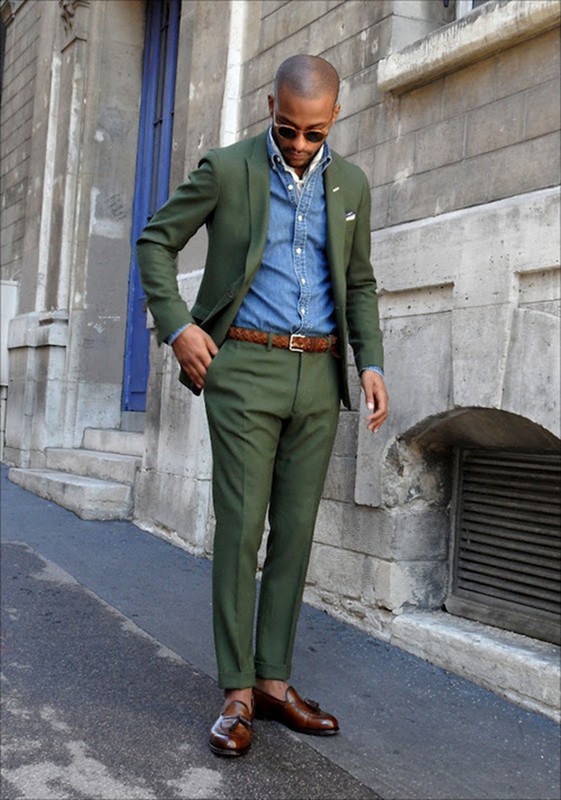 Great with a chinos, jacket and striped tie with an OCBD. They’re awful with a real suit- except, of course in black (Ian Fleming’s James Bond hated shoes with laces). Black loafers are far better than many driving shoes. Wear them without socks and a solid blue suit while traveling and drinking vodka on a plane and you are Bond, James Bond. I spent the day looking for a spare pair of loafers. Not Bass burgundy, but other more interesting colors. For a while, a couple of British shoe makers made some really nice versions. Saxon and Lotus; these brands I believe have disappeared by now since they are no where on the net. I’m hoping to find them in some old mom&pop stores here in Rome. A thought came to me when I saw an older American dressed in traditional American garb: Khakis, navy blazer, white OCBD, and Sperry topsiders. It hit me. He was too old to be wearing this traditional university look. It was awkward. Loafers might have worked better, but this combination is simply a young man’s look. Loafers are great for travel, but I think they have to be black when you’re over forty. I pray not to offend, but clothes have an age limit. A young man dressing old can look good. Us old farts have to more careful. A jacket and tie wont save us; we need to be more elegant even when casual. Or we risk looking stupid. One more thing…the pennies and dimes wont fall out of the “original” Bass Weejuns no natter how much you run…many years at prep school. Thanks CG, great to have your perspective. The loafer is certainly more of an American institution, more a casual rotation item to the English. I also agree with your points on age and dress. And you’re right; never lost any change from the loafers unless it was spent. really a great fun to read. I’m skateboarder and use vans shoes but these loafers looking kool!